Here you will find multiple tools to make sure your press release has the widest possible reach in Africa. Here you will find multiple tools to make sure your press release has the widest possible reach in Africa. It includes a calendar of non-working days in Africa, a language search for all 54 countries in Africa, an F.A.Q. dealing with how APO Group works, and some advice for your press release distribution. Considering non-working days before sending your press release in Africa is crucial to ensuring good pick up rates. This calendar lists non-working days in Africa. It does not take into account exceptional events or politics-related events (elections or others). To find out more scheduling tips, scroll down to read PR TIPS. In which language(s) should you distribute your press release? Languages are a huge factor when planning for press-release distribution or PR activities in Africa, as many countries have two official languages ; furthermore numerous media outlets are using local languages such as Swahili, Luganda, or Kinyarwanda. If you want your message to reach the people, we advise that you consider translations in local languages. To find out more about languages in Africa, click here. Select the countries you want to reach and click on Submit. APO Group offers a complete range of PR services, including press release distribution and monitoring, online press conferences, interactive webcasts, media interactions, strategic advice, public diplomacy, government relations, TV production and distribution, media buying, Twitter Q&A sessions, social media analytics, surveys, and events promotion. For more information about our services, click here. How does press release distribution work with APO Group? To know more about APO Groups’ competitive advantages, click here. APO Group provides an online media monitoring service including social media analytics included in the distribution rate. For more details about this monitoring, click here. Can APO Group translate my press release? Yes, APO Group provides translations in all African languages. To know more about which languages should be used in each of the 54 African countries read here. Which African countries do APO Group cover? APO Group covers all 54 countries in Africa. Which media will receive my press release? To know more about APO Group’s media reach, click here. How many pictures, videos or documents can I distribute with my press release? As much as you want. It’s free! Please fill out a quote form here and we will come back to you within the hour. How much value can you create by using pictures in your next press release? Why incorporate them into your content at all? Sometimes creating or selecting the most relevant illustration for your press release takes just as long as writing the release. As it happens, it is a necessary evil, as no one wants to read a newspaper that is just text or a website with nothing but words. The media are well aware that articles containing pictures, videos, or other graphical material always result in read rates well above the industry standard in comparison with text only-articles. We all prefer to read a newspaper or website with pictures or some form of media to put things into context and break up lengthy content. Press releases distributed with at least one picture always generate 20 to 30 percent more pickup. There are ample reasons for this. Say you are on the Internet searching about the recent Ebola outbreak. Reading about this topic could give you all the information you need, such as where the outbreak has been reported and the toll it has taken on the population. But blocks of text won’t make much of a difference if you’ve never heard of the places currently threatened by the Ebola outbreak. Now, if the press release or website you’re reading uses a map like the one below, it helps to put the information into context. 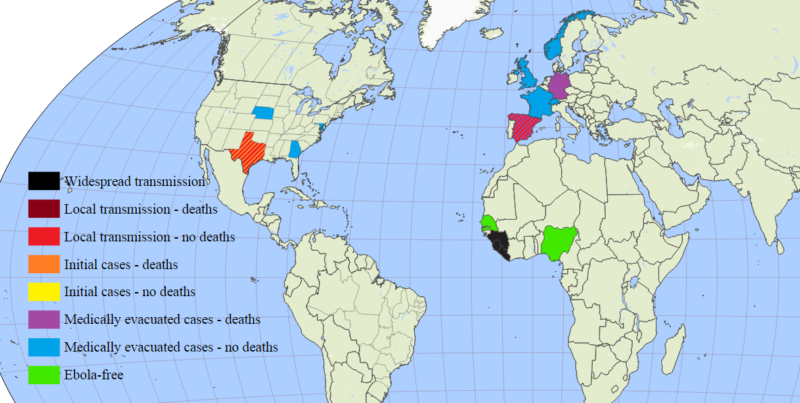 As you can see, the map allows readers to visually grasp where the virus has spread and its impact. Visual aids can be just as useful as the content surrounding them, sometimes even more. Adding pictures, charts, graphs, maps, and other images to your press release eases comprehension and leads to higher pickup rates. Nobody is going to publish something they cannot easily understand. That is the reason print media and websites will capture attractive layouts to illustrate their articles. If you do not provide them with at least one picture, they may try to find one by themselves, and you may not always like it. Your brand may be associated to a very bad quality picture or to the product of another company. Journalists may not be aware of a recent change in your management and use the picture of your former CEO, etc. The same applies for your logo. For all of these reasons, you really need to provide a picture with your press releases. At APO Group, we want our clients to be successful. You can enrich your press releases, completely free of charge, by adding pictures, videos, documents (e.g., pdf and PowerPoint), and audio files. Our clients consistently generate stronger impact and reap greater exposure by having multimedia in their press releases. We always allow unlimited multimedia content at no extra charge. We encourage our clients to add at least one high quality picture to every press release. Time is money, our clients are advised to send all pictures via email so that APO Group can handle all technical aspects (i.e., image resizing, uploading, captions, clarity, contrast, etc.) There are no complicated online forms to fill out, no wasting time trying to understand the nitty-gritty of it all, and no confusion that could ultimately affect the impact of your PR. When you add multimedia to your press release, it increases the pickup rate. It generates better impact, and it even gives people more to remember. Not to mention, pictures and videos are perfect for social media. Attaching a tweetable piece of media to a short link that leads directly to your press release can pave the way to reaching people across multiple networks, thus extending your reach. 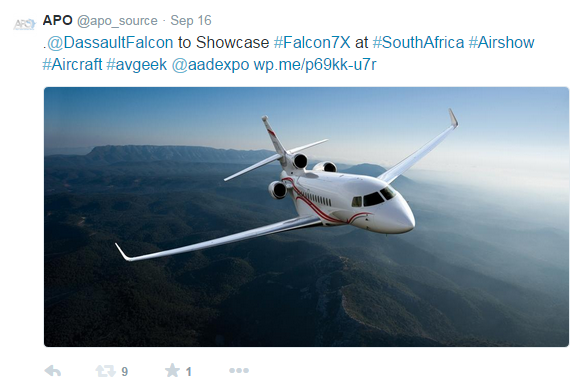 Here, for instance, is a picture from Dassault Aviation posted by APO Group: http://www.pictures.apo-opa.com/index.php?level=picture&id=1436. By being re-tweeted nine times, that tweet containing both the picture and the shortlink to the actual press release has increased its potential reach by 500,000 views. The power of multimedia is unrivaled. The question is, are you wielding it? Why not let APO Group help? It’s time for your Africa-related press release to make a greater impact! How to save on a press conference budget in Africa? APO Group (https://www.apo-opa.com) today, releases 2 videos on press conference services helping you deliver more for your budget: 1) Online press conference and 2) Interactive Webcast ; both of which are considered as the future for media relations in Africa. Fifty percent of budget dedicated to press conferences are usually allocated towards travel expenses and venue rentals. Venue costs obviously also incur other unexpected extra costs such as beverages, audio sound equipments and most often, it is not usual to be required to pay journalists transportation fees and per diem for each. Over the past five years, APO Group’s online press conferencing and interactive webcast solutions have been used by some of the world’s largest companies, institutions and organizations, out of which Western Union, Ernst & Young, the European Commission, the Food and Agriculture Organization of the United Nations (FAO), the African Development Bank, the United Nations Development Programme (UNDP), the African Union, and the GAVI Alliance to name a few. These press events have brought together hundreds of media worldwide, including Thomson Reuters, Associated Press, Bloomberg News, BBC World News, XINHUA News, Deutsche Presse Agentur (DPA), South African Broadcasting Corporation (SABC), Agence France Presse (AFP), Panafrican News Agency (PANA), along with many more local and international media corporations. “PR professionals are facing budget reductions, and therefore are unable to have face-time with journalists from all 54 African countries. Most African journalists cannot afford air tickets and accommodation to attend an international press conference. With online press conferencing and interactive webcast, journalists now can participate to a press conference without having to leave their desk! That is the reason why Online Press Conference and Interactive Webcast can save 50% of your costs when doing a press conference”, says Nicolas Pompigne-Mognard, Founder and Chairman of APO Group. Online press conferencing makes possible for a large number of journalists from different countries to participate in a press conference without travelling. It’s cost and time-effective, climate friendly, and a unique way to disseminate messages across a large number of countries, in real-time. Interactive webcast allows journalists based remotely to interact in a press conference held anywhere in the world. Not only journalists are able to attend the press conference in real-time, from any country and any computer connected to the internet, but they also are able to interact by asking questions. Did you know that there are over 57 non-working days in Africa in July alone because of public holidays in different countries? Non-working days are a huge factor when planning for press-release distribution in Africa. After all, who wants to send a press release when nobody is around to read it? Here’s another example: In the month of August, there are only seven working days (that’s right, only seven!) that don’t fall on a holiday in one of the 54 African countries. In order to help PR professionals plan their press release distributions in Africa, APO has released a Calendar of non-working days in Africa. It’s available at https://www.apo-opa.com/calendar.php. One look at the calendar, and you will realize that finding a day without a holiday in Africa can be tricky! If you need to distribute a press release in Tanzania in August, don’t do it on the 8, since it’s Nane Nane Day (Farmers’ Day). Do you want to target Burkina Faso? Forget about August 4, because it’s Revolution Day, and the next day, August 5, is Independence Day. Kenya? Uganda? Angola? Don’t waste time wondering if it’s a holiday. Instead, just check the APO Group Calendar of non-working days in Africa before planning your press release distribution. If your press release is not available until the end of the day, you’d be better off waiting patiently until the next morning before distributing it. This will help protect your ROI. Likewise, if your release is not available until Friday afternoon, think about waiting until the following Monday to distribute it. Did you know that there are more than 2,000 different languages spoken across Africa, some of which are spoken by just a few communities and others are used by millions of people and hundreds of media houses? Sixteen African countries have two or more official languages and your choice of language for your PR activities can directly affect your return on investment (ROI). After all, no one wants to hold a press conference or distribute a press release in a language that only 50 per cent of journalists will be able to understand. To do so would result in minimal media coverage and would be considered extremely disrespectful by members of the media and local authorities. “Language is a crucial factor when planning press release distribution or another PR activity in Africa. If you want the African media houses to spread your message, it is common courtesy to provide content in their working language or languages. Don’t expect them to spend time and money translating content provided in the wrong language,” said Nicolas Pompigne-Mognard, Founder and Chairman of APO Group. Understanding which languages are spoken in which areas is important to the success of any public relations activity in Africa. For example, if you’re planning press release distribution or another PR activity in East Africa, you’ll want to include the Swahili language. This language is spoken by over 100 million people. Another example, Luganda, is the major language of Uganda, spoken by over 16 million people and used by some of the most influential media houses in Uganda. To help PR professionals plan their press release distribution and PR activities in Africa, APO Group has released a Language Search Tool, which includes all 54 African countries – available for use at https://www.apo-opa.com/public_relations_africa_tools.php#anchor2. The Language Search Tool will show you which languages are spoken in the areas you are targeting for your press release or other public relations activities in Africa. After using this tool, even if only once, you’ll understand how perse the languages of this continent are. If you want to reach the maximum number of people and do so in a way that is clear and well-received, English, French, Arabic and Portuguese are not enough; it is imperative that you take into consideration the wide variety of languages spoken in Africa. Numerous articles have been published, primarily in the US, about how Google’s recent major algorithm update affects the press release distribution industry and ultimately global public relations. According to available studies, the top press release sites—including PR Newswire, Business Wire and PRWeb—are losing between 60 to 70 percent of their visibility on Google since the update. It’s no secret that Search engine optimization (SEO) can be tricky, especially with the constant battery of changes and updates that stream from Google. What can we learn from the loss of Google visibility experienced by the top press release sites? It demonstrates the fragility of the model used by these major companies. In essence, they provide their clients with one thing: online visibility. It’s much like putting all of your eggs into one basket. Hence, they are entirely dependent on Google. When Google makes a change, their model is instantly and adversely affected. APO Group has been and is the sole press release distributor in Africa since 2006. Their success has been contingent on choosing a different and stronger model. Online visibility is just a small part of the company’s media reach. In fact, APO Group’s Africa Wire has a potential reach of 600 million. Press release distribution and monitoring are vital to PR success. Like all other press release distributors, APO Group provides online visibility to its clients, with more than 50 African websites redistributing content. APO Group also provides international visibility with redistribution by Bloomberg Terminal, Thomson Reuters, Lexis Nexis, Dow Jones Factiva, and more. Fact: The most effective PR tool in Africa is the mobile device. It reaches the broadest market. APO proudly stands at the forefront of highly efficient and effective news dissemination. Earlier this year, the company signed a game-changing agreement. APO’s clients’ press releases are now available on 250 million mobile devices in 30 African countries, including the MTN Group, Airtel, Orange, and more. Client PRs can even be distributed directly via SMS. Fact: Social media reach has grown increasingly important. In fact, Twitter exposure is practically a prerequisite for press release success. Recognizing this fact, APO Group always posts a minimum of 3 tweets per release, using relevant hashtags to increase visibility and reach. Although the number of followers gained on Twitter is definitely important, so too is the quality of those followers. APO(@apo_source) is proud that the majority of its community is made of professional journalists or bloggers. 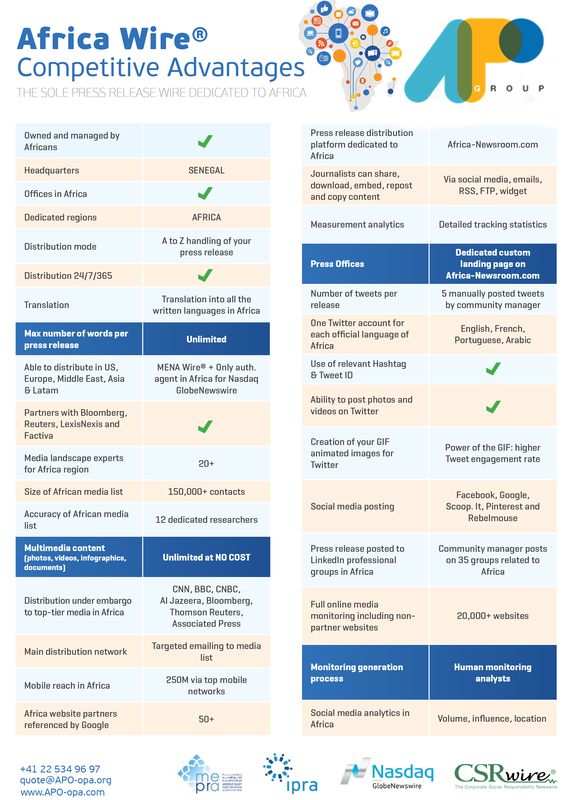 Fact: When it comes to press release distribution in Africa, APO has always seen the big picture. Instead of focusing services to meet the solitary need of visibility, they have chosen to focus using a wide angle. As a result, the company’s model is not derailed by the constant shower of Google algorithm updates. APO Group clients send all press release and multimedia content via email, and we do all of the work from creation to distribution. Text is unlimited, which means no additional charges for extra words. Multimedia content is unlimited and encouraged because it increases the pickup of the release. It doesn’t cost extra. Instead of using software to generate automatic reports, dedicated project managers oversee and manually prepare online distribution reports based on a -full- online monitoring, and not just partner websites posting verbatim. Reports can take up to 3 hours to create and include several languages, detailed stats, screenshots from social media (including tweets), and screenshots from Bloomberg Terminal, Thomson Reuters, Lexis Nexis, Dow Jones Factiva, even screenshots from Google Alerts generated by the release. APO Group professionals believe it makes absolutely no sense to create the online distribution reports only 24 hours after the press release has been distributed. They create the online distributions reports 5 working days after the distribution, so information has more time to spread in the media and more pickups are reported. Most importantly, unlike outdated companies that primarily rely on online reach, APO relies on its 100.000 contact media list, which gathers journalists and bloggers based in OR reporting on Africa. Their media list is divided by countries and topics, allowing for seamless country-based press release distribution. Releases are systematically sent to all African and international journalists reporting on the highlighted industry or subject. Managing a 100.000 contact media list requires strong expertise, including generation, indexation, enrichment and validation. It’s a very specific process, especially in Africa. APO has 9 full-time professionals dedicated to media list management. The beauty of this strategy is its lack of dependence on SEO, ranking and Google; it instead hinges on email deliverability. Classified as a “High Volume Email Sender,” APO uses Email Best Practices and maintains an excellent Email Sender Reputation with a steady Sender Score of 99/100, which guarantees the best email delivery rates in the industry in Africa. Considering that the top press release sites—including PR Newswire, Business Wire and PRWeb—are losing between 60 to 70 percent of their visibility on Google since the update, PR professionals will now be able to (re)negotiate significantly lower prices. A press release distribution service cannot be -only- an automated network of sites that copy and syndicate news releases online. PR Newswire has distributed a press release headed “PR Newswire Takes Action Against Spammers with New Press Release Guidelines & Deletion of Low Quality Content”. That gives you a clear picture of the drop in Google visibility for PR Newswire. That PR Newswire will be policing the content quality is good news (Even if that suggest they didn’t care before). But quality is actualy the least of their problems. Over the years, advertising has lost its psychological influence and subliminal power. These days, consumers and the public in general value the information they find in respectable media sources. Featuring in the news section costs significantly less than running an advertisement.In today’s competitive business climate, getting more bang for your buck is critical in marketing, especially with consumers insisting on more insight into what they are buying. For marketers who have been struggling to determine just how and where to use their budget to best influence the decisions of their selective consumers, shifting the focus from advertising to public relations has played an essential part in their marketing strategy. A recent study conducted by Nielsen found that content marketing is 88 percent less effective than public relations (Download the study: http://www.APO.af/Sdrl5x). While communication has never been easier or scarier, now that social media is a major part of almost everybody’s lives, selling still provides a company’s main source of revenue. Today, consumers receive triple the amount of incentive messages (to buy or believe in a product) and have become less loyal to specific brands. They also recognise that advertising is a psychological manipulation tool, and with that recognition comes mistrust. With this in mind, companies are now using public relations to introduce their brands sensibly, consolidating their reputation through word of mouth and engaging with their market through media stories delivered via trusted sources. With the increasing popularity of social media, the power of the internet and the likes of Google, content has become more important than ever. In Africa, where people use social media to communicate on everything from product reviews to political uprisings, PR firms have had to shake off their “one size fits all” approach and adapt content to meet the trend influencers as well as the cultural landscapes of these markets. The expertise of local PR practitioners varies across the continent but many have yet to find the perfect recipe for creating valuable content and attracting the full power of the media across borders. Content from editorial sources carries far more weight than marketing content simply because it is an editor’s role to uncover the truth. For a product, a personality or an issue to make the news, you need a good story, one that journalists will pick up and run with, becoming a trusted emissary for your message. This is why PR firms must play a proactive role in changing mindsets in order to redirect the budget towards public relations. Advertising costs are excessive and short lived, where their success is only dependent on who else is represented next to them in the magazine, newspaper, radio spot or web portal. It was with this in mind that I, Nicolas Pompigne-Mognard, founded APO (African Press Organization) and Africa Wire®, the newswire service for press release distribution and monitoring in Africa. Based in Dakar, APO helps public relations professionals transform “communications” – press releases – into valuable “information” via articles published in reputable media. “In so many ways, PR outperforms advertising for reaching targeted audiences, building brands and making the most of marketing dollars. Advertising is a necessary evil, but if you could not afford it, would it be so terrible?”.